Our 4-day mountain skills course will equip you with the skills to navigate and comfortably negotiate all kinds of mountainous terrain, plan more adventurous expeditions, and look after yourself and others. An ideal course for anyone who wants to be confident in the use of navigational strategies, and relocation strategies in poor visibility or at night, and have the confidence to go wild camping. We look at complex contour interpretation, and the more complex navigational strategies. By the end of the course we would like you to be sufficient in the use of micro navigation/night navigation. 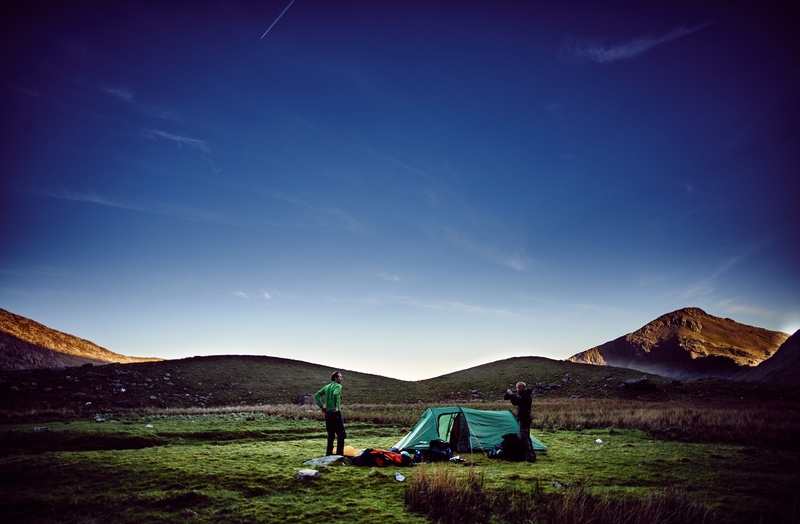 On this course we will go for a 2-day expedition, wild camping, looking at campcraft, and how to look after yourself. We will do some navigating at night, and putting into practice all of the navigational skills learnt. The course lasts for 4 days, and is run in the Lake District or North Wales. Our client-to-instructor ratio does not exceed 6:1, so that we can give you our fullest attention. Suitable for anyone who has attended the Beginner Navigation Course, or who is comfortable using a map. A high degree of physical fitness is not required. If in doubt about whether the course is suitable for you, please don’t hesitate to contact us. Each day of our mountain skills course we would introduce the topic of weather and how this may impact our route selection. Looking at complex contour interpretation, pacing and walking on a bearing, and how these are used in micro navigation. We will also introduce some easy scrambling into our journey. Talk about an overnight expedition, and what kit we expect to take. Keeping in mind weight, but also comfort. We will look at complex contour interpretation, as this is vital to night navigation/poor visibility navigation. Looking at pacing and walking on a bearing, and how these are used in micro navigation. And not to forget, relocation strategies. We will leave the comforts of civilisation around mid-morning, making sure we have all of our supplies ready for our 2-day expedition. We will be putting into practice all of the navigational strategies we have learnt, and find a location suitable to wild camp. Once the tents have been set up, and we have settling into out tents, we wait for nightfall. And then go on a night navigation journey, before settling back into out tents. And catching forty winks. Here we will have a lovely breakfast from our tent in the midst of the mountains, with breath taking views. Once, breakfast is finished, we will pack, and navigate back to civilisation. The course generally finishes between mid-morning and midday, as we will be tired from out night navigation expedition. By the end of the course you will feel confident that you can navigate in the dark. And be able to look after yourself when going wild camping in the mountains. It is a very freeing feeling to be able to use a map and compass, and know where you are exactly all of the time. If you are unsure whether the mountain skills course is suitable for you, please do not hesitate to contact us on info@riseandsummit.co.uk or call us on 07775 853 348, and we would be happy to help.